News & Trends> Product Trends > Industrial machines and equipment > Industrial Battery Charger accelerates electric vehicle servicing. Industrial Battery Charger accelerates electric vehicle servicing. BURNABY, B.C., Canada -- Delta-Q Technologies, a leader in battery charging solutions for electric drive vehicles and industrial machines, today announced that the company's QuiQ(TM )1500 Industrial Battery Charger has begun full-scale production. 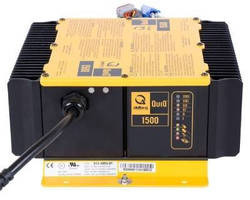 The QuiQ 1500 is a higher-power, 1500-watt addition to the popular QuiQ Series of industrial battery chargers. The new charger is available in 48- and 72-volt models and has begun shipping to customers. Sample units are available for evaluation. The QuiQ 1500 allows users to charge up to 30 percent faster than with the QuiQ 1000, as well as charge machines equipped with higher capacity battery packs. 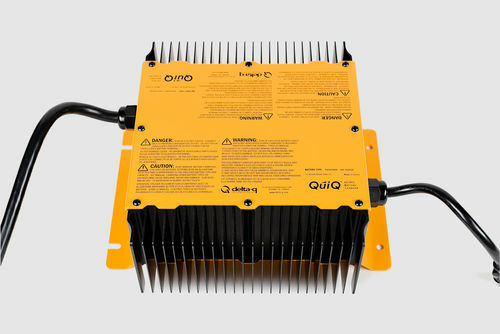 The QuiQ 1500 matches the exact dimensions and mounting configuration of the existing QuiQ, and is approved for on- or off-board vehicle applications. "The QuiQ 1500 is an extension of what has made the QuiQ popular--it's sealed, reliable and delivers exceptional charging performance," said Trent Punnett, vice president of marketing and corporate development at Delta-Q. Original equipment manufacturers can sell the 1500 as an upgrade, or can use the same charging platform on new machines without re-engineering." Applications for the QuiQ 1500 Charger include specialty golf vehicles, utility vehicles, low-speed electric vehicles (including neighborhood electric vehicles) and boom lifts. 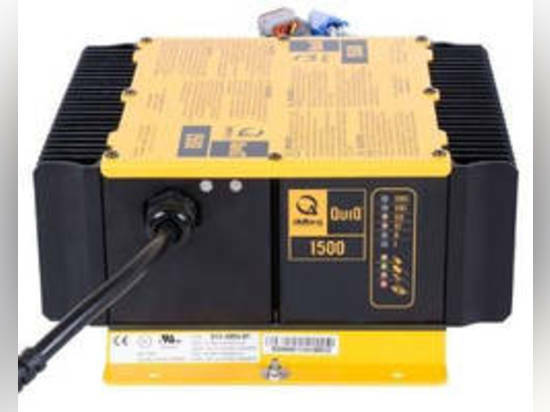 On a 110/120 V AC outlet, the QuiQ 1500 provides 1200 watts of continuous power. On a 208/230/240 V AC outlet, the charger outputs its full 1500 watts. The QuiQ 1500 meets the energy efficiency standards of the California Energy Commission. Full specifications for the QuiQ 1500 are available on Delta-Q's website. The QuiQ series of industrial battery chargers includes three models: the QuiQ 1000, QuiQ 1500 and QuiQ-dci charger/DC-DC converter. Delta-Q customers using QuiQ Series products include E-Z-GO, JLG Industries Inc., Nilfisk and Polaris Industries Inc.
Delta-Q partners with Flextronics' High Reliability Solutions business group for contract manufacturing services. Products made in these facilities have very low defect rates and long service lives. Every Delta-Q charger provides the flexibility to charge both lead acid and lithium batteries. Delta-Q chargers come equipped with charging profiles for a broad range of battery manufacturers, including Trojan Battery, U.S. Battery, Discover Energy, Fullriver Battery and Interstate Batteries. These profiles are extensively validated in Delta-Q's battery lab to ensure performance and longevity. For more information, please see the QuiQ 1500 product page on Delta-Q.com. Delta-Q Technologies develops and supplies battery chargers to original equipment manufacturers of electric vehicles and industrial equipment. Delta-Q's unique blend of engineering capability in high-efficiency power electronics and embedded software design delivers innovative battery charging solutions to meet the evolving needs of its customers. With more than 1.2 million vehicles and industrial machines already using its products, Delta-Q's innovation is enabling the widespread adoption of environmentally friendly electric drive systems. Delta-Q was founded in 1999 and is a privately held company located in Vancouver, Canada. Please visit www.delta-q.com for more information. Available in 48 and 72 V models, QuiQ™ 1500 is approved for on- or off-board vehicle applications and meets energy efficiency standards of California Energy Commission. Unit provides 1,200 W continuous power on 110/120 Vac outlet and outputs full 1,500 W on 208/230/240 Vac outlet. Capabilities decrease requisite charging time and also permit charging of machines equipped with higher capacity battery packs.